From Oscar-winning director, Kathryn Bigelow, comes a new film that continues the genre of The Hurt Locker. When Bigelow realized a young female CIA agent was at the center of the search for Bin Laden, she became intrigued. 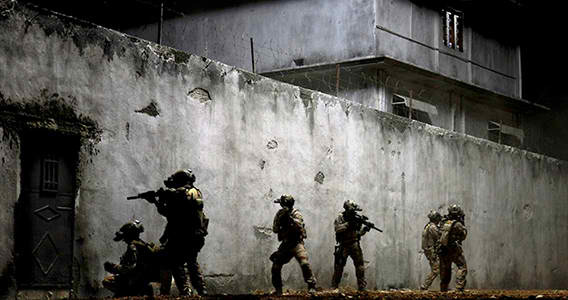 The film, written by Mark Boal, chronicles the Seal mission which ended in the killing of Osama Bin Laden. This project began six years ago with a very different ending planned. Then, in May 2011, the world learned about the stealth assault conducted in Pakistan. There was a major stink and investigation into whether Boal received classified information as he conducted research for the film’s “new” ending. He maintains that he did not. Lucky for us movies allow for dramatization and artistic license to fill in the blanks. However, Bigelow worked tediously to make the scenes as accurate as possible referencing video footage and interviews from Boal.